After all the leading OEMs are done releasing their flagship devices for this year, Apple’s the only one left, those who are aware of the company’s tactics of staying discrete. But over the last couple of months, we’ve been hearing some whispers about the upcoming iPhone 6. So far, the reports suggest that the phone will be featuring a new graphic architecture, and will be sticking to the same camera resolution, but this time around, with a better sensor. We’ve also had our hands on some leaked pictures that showed us the alleged front panel of the phone itself. 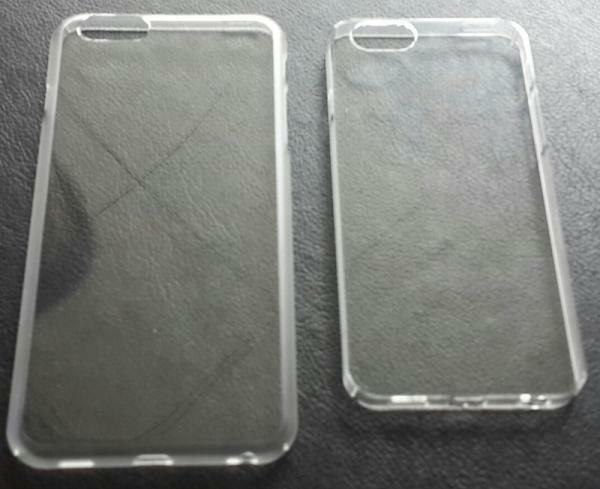 Now the latest leak we have shows us the cases of the upcoming iPhone, the cases however, are completely transparent. One thing that can be noted from the picture is that iPhone 6 will definitely have a larger screen size. Rumours so far have suggested that the screen size will be somewhere between 4.3 – 4.7 inches, many rumours also suggest that Apple is planning on releasing two phones and one will have a screen size somewhere between 4.5 – 5.7 inches. But we can’t say anything for sure until we have an official confirmation from Apple. The picture shows that the power and sleep buttons are placed differently this time to help ease the phone operation. This claim was made by a Chinese analyst Ming-Chi Kuo. He claimed that this subtle change will help in operating the phone with one hand. Previous rumours suggested that Apple will be using an iPhone with 4.7 inches screen in September, later this year. Followed by another variant with possibly a bigger screen size. However, there is not a single official word by Apple, but knowing that the company is working on iWatches and will be releasing them in the the 3rd quarter, later this year. So we can assume that Apple will be announcing the phones somewhere along that timeline. If we’re lucky, they just might release the phones. We’ll update you as soon as we have more official words. Thanks to Mobile Fun for the news.